Help! My dog pulls on the leash! Pulling on the leash is one of the most common forms of unwanted behaviour that dog owners deal with. This behaviour is often learned when dogs are still young and have to wear a collar or dog harness. It is still manageable when puppies pull on the leash, but as dogs grow older and bigger, pulling on the leash becomes increasingly difficult and annoying to deal with. At this point, the behaviour has often been a habit for a long time. In this article, we will discuss why dogs pull and what you can do about it. Why does your dog pull? Dogs that pull on a dog leash are not necessary dominant. This is what dog owners often believe. There are various reasons for dogs to start pulling. This usually involves the dog seeing or smelling something that it wants to get to but that is outside of the reach of its leash. This is very clear with puppies, as they have a natural curiosity and want to smell everything. By pulling on the leash, dogs often manage to get to that place that is outside of the reach of their leash and have a good sniff around. This is how the dog achieves its aim. As the dog's owner, if you allow this, the animal will quickly learn that pulling on the leash will lead to the result that the dog wants. It is self-rewarding behaviour and the dog will learn this very quickly. In addition, the normal walking pace of (larger) dogs is faster than ours. When a dog walks at its own pace, this will create tension on the leash. Due to their eagerness and high energy level, young dogs will have more trouble focusing on their owners, and therefore have more of a tendency to pull on the leash. As time goes on, it often becomes a habit for dogs to pull on the leash, because the dog has never been taught not to. How can you teach your dog not to pull? To teach your dog to stop pulling the leash, you will need a lot of patience and consistency. The training in itself is not difficult, but the behaviour is often rather stubborn and requires long-term training. The pitfall of this training, for many dog owners, is that they sometimes allow the dog to pull after all. When you start the training, this means that from that moment the dog cannot ever pull on the leash again. This includes when you are in a rush and want to go for a quick walk. If you are not consistent, it is not clear for the dog when it can and cannot pull, and this will only make it more difficult to unlearn the behaviour. The dog ultimately needs to learn to go for a walk without pulling. Pulling on the leash must have the opposite effect rather than a rewarding one. Please note: walking with a slack leash is not the same as "heeling" the whole time. This is because "heel" is a command where the dog walks right next to the owner's left leg, and this requires a lot of concentration from your dog. When going for a 30 minute walk, in terms of concentration, it is not feasible for dogs to constantly follow the "heel" command. Many people try to stop their dogs from pulling by giving a sharp tug on the leash. This may work for a few moments, but is not the correct way to teach the dog not to pull. This is because for the dog, the reward of pulling is often more important than the correction by its owner. What's more, dogs often fail to understand what they are being corrected for. Some dogs think that they are being corrected for walking in a certain direction. They then get confused because after correcting them their owner continues to walk in the same direction with them. Owners tugging on the leash also feels unpleasant for the dog and does not contribute to a good dog-owner relationship. Tugging on the leash by owners can also lead to damage in the dog's neck area. The flexible leash is often use to give dogs a little more freedom on walks. This leash can actually make pulling worse, because it makes it unclear for the dog what the length of the leash is and where the line is. One day the leash is long and then next it is short. To make this clearer for the dog, you could show your dog the difference between a short leash (close) and a long leash (free) by using commands. This gives the dog an idea of what to expect. However, if you want to train your dog to stop pulling on the leash, we recommend that you use a leash that is not adjustable in length. In this section, we will discuss a number of training methods for stopping unwanted pulling on the leash. These methods only work when they are applied for longer periods of time. What's more, it is important to be consistent and stay that way during training. This method consists of stopping as soon as there is tension on the leash. You don't say anything to the dog at these times. This stops the dog from reaching its objective and forces it to focus on you. Pulling on the leash becomes pointless. Wait until you have your dog's attention (such as the dog looking at you) and wait for the dog to release tension on the leash. Most dogs will take a step back after some time. At that point, you can reward the dog with your voice or a treat and then continue on your walk. Every time there's tension on the leash, you need to stop walking immediately. Instead of waiting for the dog to take a step towards you, you can also ask it to come "close" (if the dog knows this command). If the dog does this nicely, you can continue walking. It is also important to reward the dog when it focuses on you of its own accord and when it walks along nicely without pulling. This training is time-consuming and sometimes means that you needs to stop 30 times on a short walk. This makes walks less fun for the first period of the training and many people tend to give up quite quickly. However, you will see results if you give it time. If you have been using this training successfully for some time, you can ask your dog to pay extra attention by sticking to various walking paces or by going in a different direction every now and then. For example, going from a slow walk to a fast one or curving to the left or right. This means that the dog has to be highly alert to the owner's movements in order to adjust to these constantly. A variant to the "pulling = stopping" method is "pulling = turning around". Instead of the dog leading you, this ensures that you are leading the dog. As soon as there is tension on the leash, turn 180 degrees and walk in the opposite direction straight away. When your dog walks with you and when it walks without tension on the leash, you can reward it. This also teaches the dog that pulling does not work and won't get the dog where it wants to be. A clicker is a good aid that you can use to reward your dog. You could use this in the above training methods, for example. However, it is important to first introduce the clicker to your dog properly first. This is because the dog needs to learn that the clicker means a reward is coming. You can do this by following up the clicker noise with something tasty for the first period of training. When the dog understands this, you can easily use the clicker to reward your dog. The advantage of using a clicker is that you can accurately time the rewards. For example, when you need to get a reward from your pocket first, you're often too late and are in fact rewarding other behaviour than you intended. 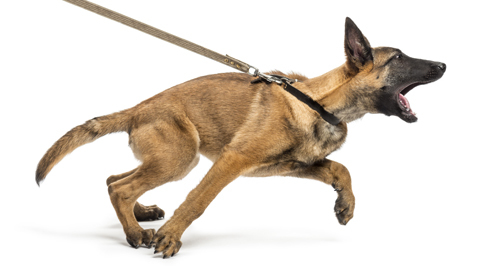 At the start of training, puppies will not always be able to walk nicely on the leash. This is because walking on the leash is completely new to them and they are not able to fully focus on their owners yet. You can start training your puppy from a young age. When your puppy is (accidentally) walking nicely next to you, reward this behaviour. After some time, your puppy will be able to link good walking behaviour and getting a reward. You can also tempt your puppy to walk nicely next to you by holding a tasty treat in your hand. You can use the command "close" to link to this behaviour. For young puppies, it is pointless to give commands for this action. There are likely to be too many distractions on your walks and the puppy is highly unlikely to follow the command. This is why you should only give the command when your dog is actually walking next to you. When the dog gets older, this command can of course be used to ask the dog to carry out an action. When the puppy sees something that it really wants to get to and starts pulling on the leash, the best thing to do is get your puppy's attention by offering it a tasty treat, making a funny noise or getting down to its level. As soon as the puppy comes up to you, it receives a reward and you can keep walking. This gradually teaches the dog that pulling on the leash does not have the intended effect and that paying attention to its owner is rewarded. A number of tools have been developed to stop your dog from pulling on the leash. The Gentle Leader is an example of such a tool. The strap runs across the dog's nose, pulling the dog's head to the side when it pulls on the leash. This will stop the dog's tendency to pull. Some dogs may find this strap irritating. It is therefore sensible to introduce and teach your dog to wear the strap gradually. Another tool is the Halti-Harness. This makes it easy to guide the dog because the leash can be attached to the dog's chest, resulting in the dog being pulled off-balance, which makes it harder for the dog to pull. The above products can be effective in reducing your dog's pulling. However, the dog does not learn to walk without pulling. Some dogs will even get used to these tools and pull after all. Training a dog to walk without creating tension on the leash is much more effective. We advocate against the use of choke collars and prong collars, as these are not suitable for teaching your dog to stop pulling. They are also bad for your dog's well being, as they result in discomfort and pain for your dog. This will probably stop the dog's tendency to pull, however, using these products will not teach the dog to walk without pulling either. Please note: we have only discussed a number of training methods and chosen to focus on the most commonly used training methods when writing this article. Helps stop pulling on leash. Handy extension for short leash. Harness with a unique front attachment. Prevents pulling on the leash. Ideal Clicker for owners beginning to train their dogs.